This May long weekend, visitors to BC’s Gold Rush Town travelling from Quesnel will have a fun new way to experience the 80 km trek along the famed “Cariboo Waggon Road,” thanks to the efforts of Gold Pan City’s newest passenger service provider – West Coast Nature Tours. West Coast Nature Tours, a successful Lower Mainland transportation company owned and operated by Maike Koch, has recently relocated to the Cariboo and will provide a special Barkerville Shuttle service daily from Quesnel to Barkerville Historic Town and Bowron Lake Provincial Park during the 2011 summer and shoulder seasons. The Barkerville Shuttle service started May 14th and will run until September 25th. “With this new Barkerville Shuttle service, travel costs for individuals coming from Quesnel can be considerably lowered,” Douglas said. Visitor Centre, Safeway, the Quesnel Airport, and the new Barlow Creek Inn on Highway 26. Pick-up begins at 8:00 a.m. for a 9:30 a.m. arrival at Barkerville, and leaves for Quesnel again at 4:30 p.m. for a 6:00 p.m. drop-off. Additional departure times will be offered throughout the summer as needed, and alternate schedules for group bookings will be available. Special evening “dinner theatre” packages will also be offered on weekends throughout July and August, when the Theatre Royal begins its much anticipated Evening of British Music Hall series for the 2011 season. Updated travel information can always be found at www.barkerville-shuttle.com. 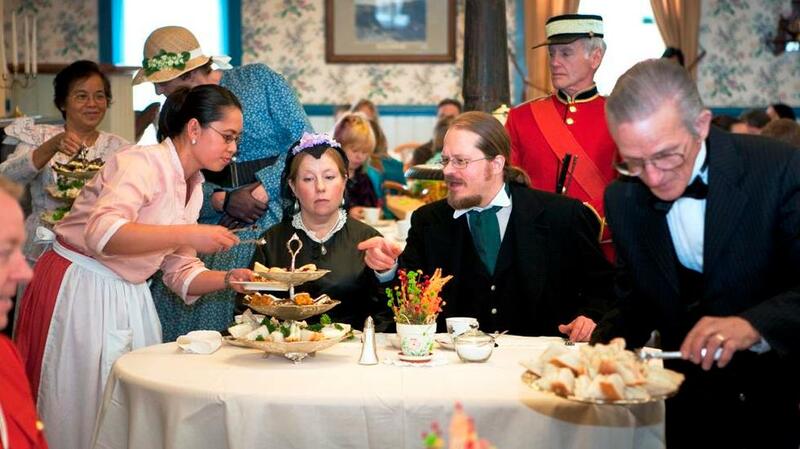 Speaking German may come in handy on Monday, May 23rd, when Barkerville hosts its 6th annual Victoria Day Royal Tea Party at the world-famous Wake Up Jake Restaurant. “Queen Victoria” and “Prince Albert” who will be in attendance for several sittings during this popular, historically interpretive event, both spoke German fluently. For more information about this truly adventurous transportation option, visit www.barkerville.ca.